This study evaluated oxalic acid accumulation and bioremediation of chromated copper arsenate (CCA)-treated wood by three brown-rot fungi Fomitopsis palustris, Coniophora puteana, and Laetiporus sulphureus. The fungi were first cultivated in a fermentation broth to accumulate oxalic acid. 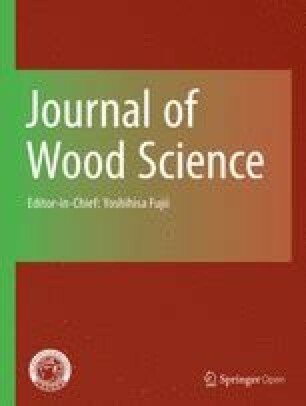 Bioremediation of CCA-treated wood was then carried out by leaching of heavy metals with oxalic acid over a 10-day fermentation period. Higher amounts of oxalic acid were produced by F. palustris and L. sulphureus compared with C. puteana. After 10-day fermentation, oxalic acid accumulation reached 4.2 g/l and 3.2 g/l for these fungi, respectively. Fomitopsis palustris and L. sulphureus exposed to CCA-treated sawdust for 10 days showed a decrease in arsenic of 100% and 85%, respectively; however, C. puteana remediation removed only 18% arsenic from CCA-treated sawdust. Likewise, chromium removal in F. palustris and L. sulphureus remediation processes was higher than those for C. puteana. This was attributed to low oxalic acid accumulation. These results suggest that F. palustris and L. sulphureus remediation processes can remove inorganic metal compounds via oxalic acid production by increasing the acidity of the substrate and increasing the solubility of the metals.